What Causes Leaf Gall and Is It a Serious Problem for Trees? Many homeowners who landscape their properties with trees are taken aback when they spot infestations of leaf gall on their favorite specimens. Appearing as little bumps on the foliage of a tree (as if your plant were breaking out with some weird type of acne), these disfiguring eruptions look terrible. But how bad are they for the long-term health of your plant? And what is the cause behind them? What Causes Leaf Gall? How Big a Problem Is It? "We have a river birch tree which is about three years old," writes one reader. "Suddenly this summer, small bumps are appearing on some of the leaves. Is this a disease and can it be stopped?" What this reader is reporting is a case of leaf gall. Those small bumps are caused by an insect that eats or lays eggs on the plant's foliage. One Master Gardener explains that the gall "is the plant's response to the resulting irritation," drawing an analogy to what happens to the human body after a bug such as a mosquito bites us: a bump is left behind. She notes that, while galls are rarely fatal, "they may cause early leaf drop," but she adds that a healthy, mature tree will be able to cope with such leaf drop by producing new foliage and that a serious problem should only result if the galls keep coming back for several years in a row. The bad news is that, once you spot these bumps, the damage has already been done. You can't spray to get rid of the bumps that are currently infesting your tree's foliage: you are stuck with them for the present year. As the same source notes, however, if leaf gall is a recurring problem for you, you can spray in early spring to get a jump on the insects. 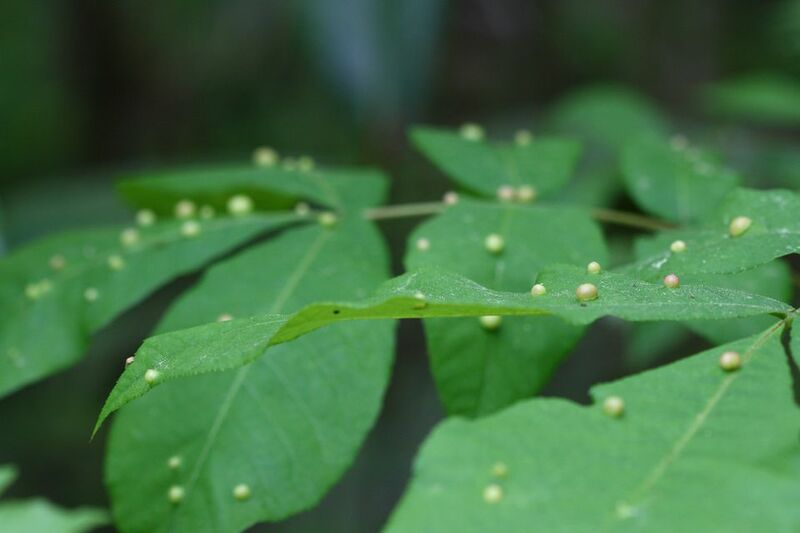 However, do note that you can't just spray willy-nilly: the spray that you use must target the particular insect that is causing the leaf galls to form. One problem with spraying, however, as pointed out by the Missouri Botanical Garden (MBOT), is that you will be killing beneficial insects, too -- insects that may actually be able to help you control your leaf-gall problem over the long haul (by killing the insects who cause the galls). They emphasize that spraying is a preventive measure, and that a certified arborist should be employed for the job (because it takes great skill "to identify the gall-producing organism"). The good news, again, is that leaf gall is typically not considered very dangerous (either in general or to river birch trees, specifically). In fact, MBOT asserts that a leaf studded with these ugly growths is still "usually able to carry out photosynthesis at near normal levels." View this FAQ on azalea gall -- a different type of growth -- to see what a gall on an azalea leaf looks like. Need Help Dealing With Magnolia Problems? What Kind of Ornamental Tree Should I Plant?